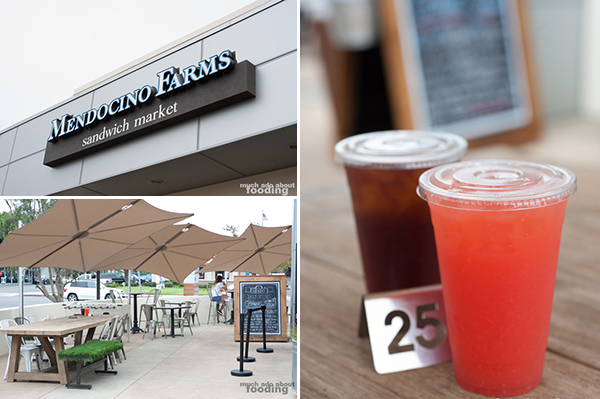 Founded just shy of 10 years ago, the Los Angeles-based sandwich shop sweetheart, Mendocino Farms, has finally reached down to Orange County to many people's delight. 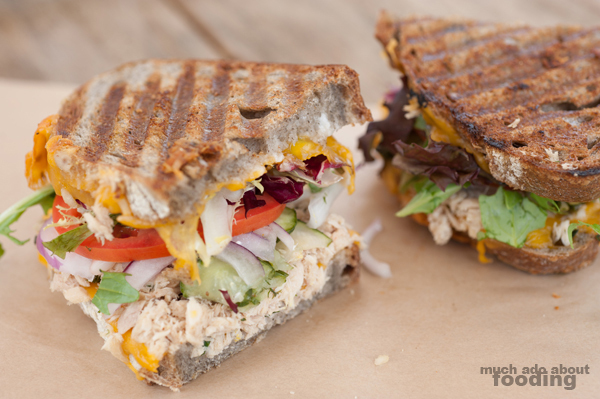 Opened in May of this year on the up-and-coming 17th Street in Costa Mesa, the "sandwich market" has already found itself some fans, particularly people who were accustomed to driving up to LA to get a bite of their favorite lunch. Since we had never visited its flagship location or any of the others in our neighboring county, we did not know what to expect when we arrived to dine (on invitation) at the first OC spot. I'll admit that the first impression was not good as the parking situation was atrocious but that is not the restaurant's fault. After we made our way in though, it was smooth sailing. The layout of the restaurant is self-explanatory - entrances lead you right to the large menu board where a friendly helper stands to take your orders on long slips of paper and make recommendations if you are overwhelmed by the choices available. We were assisted by the contagiously-happy Anai M. who guided us through our selections and was more than open to answering our questions. After that part of the process, you then have to decide just about how many samples you want to try from their deli case full of side items; oh don't worry - they'll most definitely encourage you to try them all. We snagged their Strawberry Lemonade ($2.75) and Passionfruit Black Iced Tea ($2.50) with our order too. You can then watch the food being made at the exhibition kitchen or go find yourself a seat in the farm-like inside seating area or patio/picnic-like outdoor sitting area. Either way, there will be plenty of wood, earth tones with stainless steel mixed in, and faux grass to keep you in the zone. 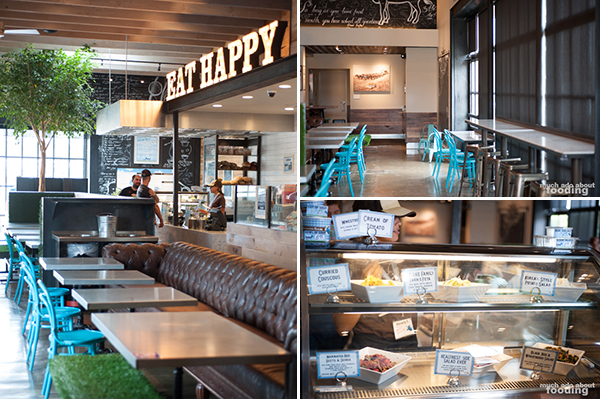 Mendocino Farms' pride comes from their commitment to local and seasonal ingredients sourced from nearby farms and artisans who also follow the same commitment to quality. 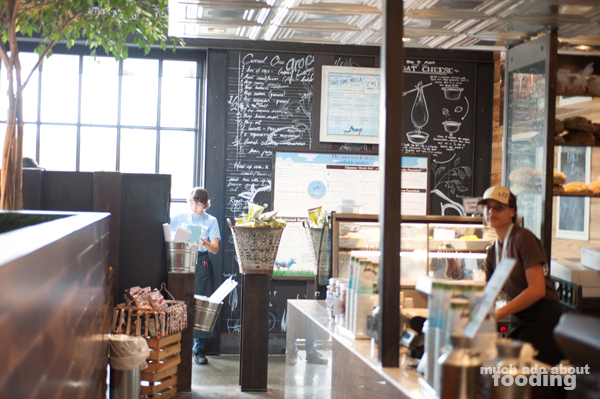 Their disposable menus that one could take away share that love on the back by listing all of the farms from which their ingredients are sourced with personalized description of each. I can see this being assuring to guests who want to know more about their food choices here. All of the sides sampling was not very fair to us when we were already hungry. It left us needing to go ahead and add it to the sandwich order but not just one; there were two that caught our tastebuds. 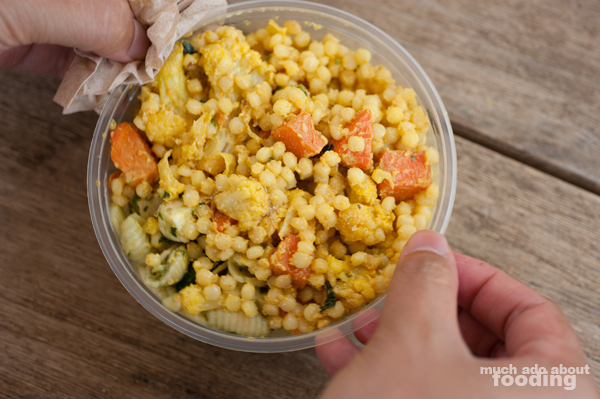 We went for the Curried Couscous with its bright and back-end heat and the Drake Family Farm's Feta which came with basil pesto shells and was a cooling, savory side. To make sure that we did not only try their sandwiches, I chose to try their Sophisticated Chicken & Prosciutto Salad ($10.95 - Creminelli prosciutto and shaved, roasted free-range chicken breast, seasonal market roasted vegetables, local Gioia fresh mozzarella, crushed honey-roasted almonds, marinated red peppers, red onions, grape tomatoes, Scarborough Farm's greens, butter lettuce and Romaine with basil pesto-balsamic vinaigrette).There were quite a lot of ingredients in this salad with plenty of variation in types of food but the selections seemed overwhelming and the vinaigrette underwhelming. It struck me as light with much too much focus on the individual ingredients' flavors rather than a happy marriage of them all in one cohesive dish. Perhaps more acid would have matched them better together and smaller pieces of prosciutto which tended to disrupt bites with its size. Despite this, I did like how fresh everything was and the amount for the price point. It appeared to me that all of their entree salads were that substantial. As with the salad and any other menu item, the sandwiches we ordered came with detailed descriptions of every piece of their puzzle as well. They were not wimpy sandwiches by any means and required several napkins at our table to mop up the sauces and tumbling ingredients (if they didn't make it into our mouths). 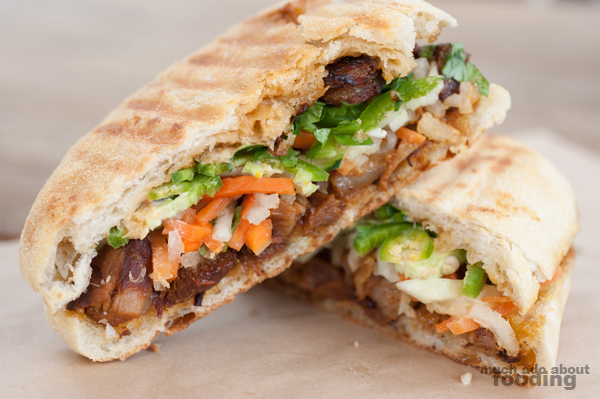 The first victim of our lunching hunger was the Kurobuta Pork Belly Banh Mi ($10.45 - braised, caramelized Kurobuta pork belly, housemade pickled daikon and carrots, cilantro, cucumbers, jalapenos, and chili aioli on a panini grilled ciabatta), their #1 seller. The style of pork belly was more like the Vietnamese BBQ pork being sweeter than salty and thus with less weight. While the grilled ciabatta had a lovely crunch to it, it still cannot hold a light against the rip-the-roof-of-your-mouth-sharp baguettes that typical Vietnamese banh mi has. However, all of the other components were fantastic takes on the iconic Asian sandwich, particularly the pickled daikon and carrots. Our second sandwich was their Modern Tuna Melt ($8.95 - white albacore tuna with fresh herbs, farmhouse Cheddar, vegenaise, housemade pickles, red onions, tomatoes, and Scarborough Farm's greens on panini grilled buckwheat), the third popular sandwich in Orange County right behind their classic turkey club sandwich. Seeing as the restaurant is fairly health conscious, there was only a dab of vegenaise in the whole mixture so that the pieces of tuna did fall off of the sandwich on occasion. The amount of fresh vegetables helped also cut through the typical heaviness of a tuna melt without detracting from the fish's flavor. What seemed odd was how the Cheddar had immediately melted on the bread thereby becoming just crisps for the sandwich; nevertheless, this was my favorite of the entrees tried. It offered plenty of perspective between the protein and produce. There is certainly more on the menu that we did not get to try but which you ought to turn your fancy towards. The well-organized and designed menu separates the sandwiches into their sections and endearingly uses icons next to every dish to show which proteins are where. 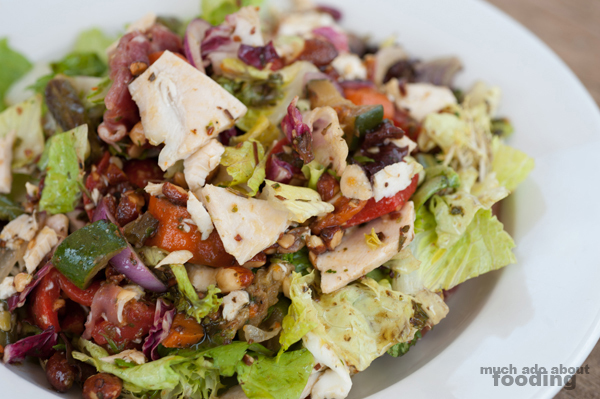 We learned from the manager that Mendocino's ingredients are ordered fresh daily for just what they expect to turn over that day so rest assured that your sammie will have a fresh whammy! Find them over at 450 E. 17th St. Costa Mesa, CA 92627 if you'd like and remember to pet the blue cow right outside.